A Fylde coast MP has welcomed the scrapping of a plan to axe funding for some rural bus services. Following the launch of The Gazette’s Save Our Buses campaign last month, Mark Menzies said he contacted Lancashire County Council in protest over its move to withdraw support for services in Fylde and Wyre. Last week, the county council’s cabinet decided not to include a blanket withdrawal of subsidies for rural services, a victory for more the hundreds of people who signed The Gazette’s campaign petition. Mr Menzies said: “Some of our villages are extremely rural and there can be a fine line for more vulnerable people between enjoying the tranquillity of those rural idylls and feeling cut off and stranded. 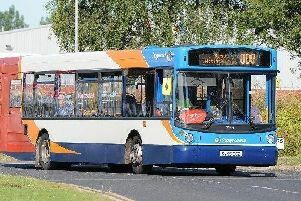 “That is why I was so disappointed to see that LCC was considering scrapping bus routes in those areas and I wrote to the Chief Executive to tell her I expect people in Fylde to receive the best services available for the amount of council tax they pay.